The leading provider of industrial facilities for Small to Medium-sized Enterprises (SME’s), Majaal Warehouse Co. (“Majaal”), today announced the appointment of 3BL Associates Consultancy W.L.L. (3BL) as Corporate Sustainability Consultant for its industrial facilities projects. The engagement will result in key recommendations to improve Majaal’s operational efficiency through a corporate sustainability framework. Amin Al Arrayed, General Manager of First Bahrain and Managing Director of Majaal Warehouse Co. was interviewed for an article published in the Al-Wasat Newspaper on 24 November 2013. 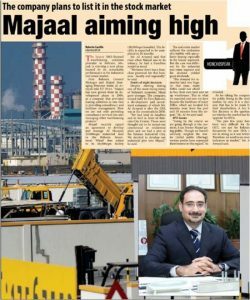 Amin Al Arrayed, General Manager of First Bahrain and Managing Director of Majaal Warehouse Co. was interviewed for an article published in the Daily Tribune Newspaper on 5 November 2013. Further establishing their reputation as the leading provider of industrial facilities for Small to Medium-sized Enterprises (SME’s), Majaal Warehouse Co., announced today the opening of a new line of business as it signed an agreement with Al Mazaya Holding Co. of Kuwait to oversee the development and leasing of their new USD 20 million industrial facility to be located at the Bahrain Investment Wharf. The new project represents Foreign Direct Investment in Bahrain and is a strong vote of confidence in the economic recovery and growth presently underway. Majaal Warehouse Company, a developer and operator of industrial facilities, has signed a key sponsorship agreement with Hilal Conferences and Exhibitions (HCE) to participate at Gulf Industry Fair (GIF) 2014 in February. 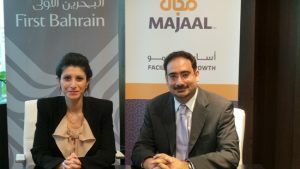 In a recent interview with Marcopolis, First Bahrain General Manager and Majaal Managing Director Amin Al Arrayed discusses the SME sector of Bahrain’s economy and how Majaal has been developed with this target market in mind. We are pleased to announce that the Annual General Meeting of the shareholders for the year ended 31 December 2012 has been rescheduled to take place next week on Thursday, 26 September 2013. We are pleased to announce that the Annual General Meeting of the shareholders for the year ended 31 December 2012 is scheduled next week for Thursday, 19 September 2013. 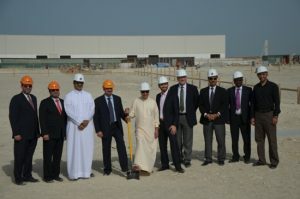 Majaal Warehouse Company yesterday held a groundbreaking ceremony at the construction site for the final phase of its initial $45 million development at the Bahrain Investment Wharf (BIW). Amin Al Arrayed, General Manager of First Bahrain and Managing Director of Majaal Warehouse Co. was interviewed for an article published in the AlWattan Newspaper on Apr 10th 2013.